Today I came across this plume moth, Amblyptilia acanthadactyla. 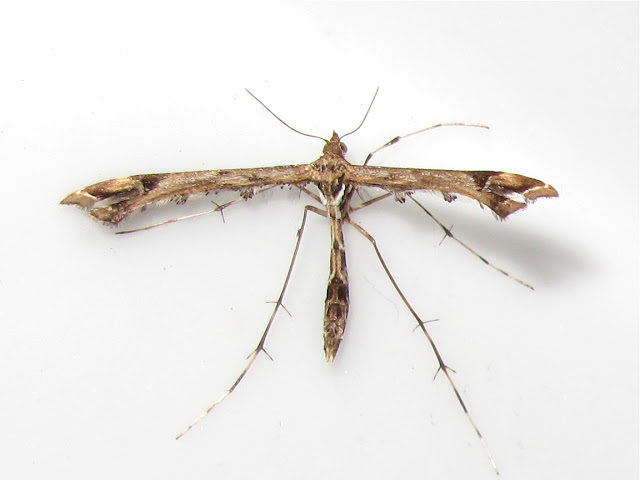 When I picked it up I thought it was Emmelina monodactyla, a plume moth common in my garden. But the macro shot revealed otherwise: the tufts of scales protruding from the back of the wings are characteristic of the genus Amblyptilia. Its larvae feeds on a range of plants including Hedge Woundwort, Stachys sylvatica, which I have extensively naturalised in my garden to atract the bee Anthophora furcata. It is interesting to see how introducing a single native plant in the garden can result in several bug species becoming more abundant: the woundwort shieldbug, Eysarcoris venustissimus, several other tiny bugs I still have to blog about, and bees, of course, including the Wool Carder bee, Anthidium manicatum. But going back to this moth, it appears to have become more abundant from the 1990s especially in gardens. There are two generations a year, one of them produced in September, hibernates as an adult, so this one, which I disturbed while watering some plants in the garden, has decided it is spring already. Had what I assumed was an emmelina monodactyla hanging about on the bedroom ceiling for the last few days. Decided today to get a closer look before putting it out into the garden, but realised it was something else. Couldn't find it in my reference books, so took a picture and googled. Came across your picture which seem to be of the same type of moth. I'm in Worcestershire. Would be happy to email the photo to you if you are interested. My email is bugman1@live.co.uk. I just saw one in my hotel room in fuerteventura (Canary Islands) and wondered what it was! Just spotted this on my patio in Ohio.